During incubation, there is a suggested relative humidity range for the species you are hatching given by incubator manufacturers, based on tried and tested methods. Chicken eggs for example should be between 40% – 50% in order to get successful results. Taking all of the possible variables into account, (room humidity at the time of year, number of eggs, losing moisture in the incubator, air flow in and out of the incubator etc.) it can become a bit of a guessing game to maintain the correct humidity unless you have a fully automatic humidity control on your incubator meaning that sometimes eggs fail to hatch under the conditions that had worked for you previously. Egg shells are porous and moisture is lost through the shells by evaporation during the incubation process. Depending on the humidity levels around the eggs, more or less moisture is lost. As moisture is lost, the egg loses weight, however, be aware that not all egg shells are equal and some lose weight faster than others as there are individual differences in shell porosity between eggs. The most common reason for hatch failure (where you have had fertile eggs, they develop but die in the shell before or during the hatch) is caused by too much humidity. In other words, not enough moisture has evaporated from the egg over the incubation period. The air space inside the egg that is created as moisture evaporates plays an important role in the survival of the emerging youngster and with too much humidity, the egg has not lost enough moisture. The youngster is usually too large and cannot move inside the shell when trying to pip and with little air, it may drown in its own shell or suffocate if it is unable to break the membrane between it and the shell. Conversely, eggs that lose too much moisture because of low humidity levels, produce a larger air space but a smaller, weaker youngster is formed in the remaining space and will probably die before or during the hatch. With the correct humidity and the correct weight loss, the correct amount of air space is formed inside the shell and the chick gets its first breath of air and has enough room to move around as it pips around the top of the shell and hatches! If we measure this weight loss every 3 to 4 days over the incubation period, it is possible to make adjustments to the humidity during the incubation process by comparing the weight loss of the eggs with the ideal weight loss of that species (see table 1 below). The good news is that it is the weight loss over the entire incubation period that matters so if the weight loss is wrong, it is possible to make fine adjustments to get back on track. Table 1 – Hatching conditions showing weight loss for different species. An example weight loss calculation. The following example shows how this method can be put into practice when hatching chickens. Chickens have a 21 day incubation period and an ideal weight loss at the point of pipping of 13%. Set the incubator to the correct temperature (in this case 37.5°C), and allow it to settle for a few hours, then, set it to the correct humidity for the species (in this case 45%). Allow 24 hours for everything to settle. During this time, if eggs have travelled through the post, leave them to rest and to reach room temperature. Store them pointed end facing downwards. Next, allow the eggs to come up to temperature in the incubator. This can take up to 24 hours, now, check and make fine adjustments to the humidity again. 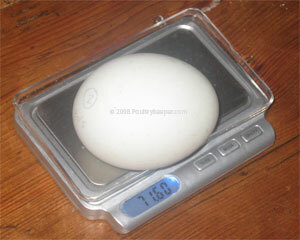 After 3 to 4 days, weigh the eggs again and record the results, taking the average weight of the eggs again. There are now two ways of calculating the weight loss. The first is to draw a graph which shows the ideal weight loss line, plotted from Day 1 (62.75g) to Day 21 (62.75g – 13% = 54.6g) then whenever you weigh the eggs at 3 to 4 day intervals in between, plot the average weight to see how close it is to the ideal weight loss line. The second method is to calculate the average weight loss during incubation on the day that you weigh the eggs so if you weigh the eggs on Day 4, the ideal weight loss will be: 13% / 21 Days = 0.62% loss from the original weight on day 1, 1.24% of the original weight loss on day 2 and so on. Take the average weight of your eggs every 3 to 4 days and make fine humidity adjustments as necessary until the last couple of days before the hatch when the humidity should be increased to the recommended level (greater than 65% for chicken eggs) to help soften the egg shells before piping. Remember: If the actual weight loss is greater than ideal, the humidity level has been too low and it needs to be increased to compensate. If the weight loss is less than ideal then the air has been too humid and the humidity will need to be reduced to compensate. After candling, it can be necessary to remove eggs that are infertile. This has little effect on the average weight calculation if all of the eggs are of a similar weight. Be cautious though, if you are only incubating a few eggs at a time or the eggs are different in weight (different breeds of chicken eggs for example) as there can be a noticeable shift in the average weight of the eggs that causes unnecessary humidity corrections. The only sure way to avoid this is to go back and re-calculate the start and end average weights using only the fertile eggs. In this situation, method 2 becomes easier to re-visit than the graphed method 1. One final remark is that you should ideally weigh the eggs at roughly the same time every day to get the most accurate results if you are using whole days in the calculation, although I suppose there would be nothing stopping you including a part day in the calculation.